This is our exclusive Kratom Powdered Resin Extract "Bronze". 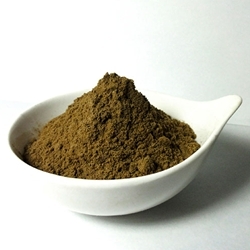 This is our gentlest Kratom Powdered Extract, and an equally as strong seller as our "Silver" and "Gold" products. Buy Kratom carefully chose its Kratom suppliers, and this is another product we're proud to offer. Forget all the varying names used by vendors to entice you into buying their product such as "super" or "indo" or "green malay" and countless others; we simply offer you the same carefully-crafted extract that we work with ourselves in simple to understand strengths. All three of our main powdered extracts are from smaller suppliers who have fine-tuned their extraction process over the past few years out of the same passion for Kratom that we have. This product is not intended or sold for ingestion by humans or animals. It's sold for research, for topical use, an incense component, or for aromatherapy purposes only.